Maxstor’s filing cabinet creates professional sophistication to your office, and allows a secure way to store your important work related documents. 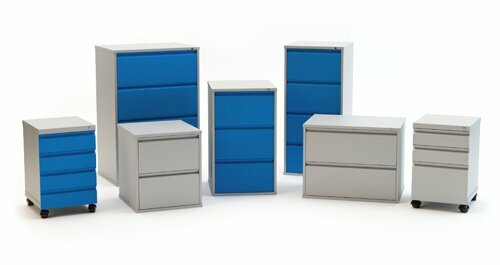 As filing cabinet manufacturer in India we have built fully welded construction and double skin drawer fronts. Drawers are mounted on slides providing easy-smooth action and 90% extension for access to the whole drawer. The range includes four, three and two drawer for vertical filing cabinet and lateral filing cabinet suitable for legal or letter size filing. Lateral filing cabinet provide wide filing space for large organisation, or offices that generate and records document in a large quantity. Drawer dimensions are suitable for legal and letter size files. Pedestal cabinets are designed for placing under table, containing drawers for keeping files and general stationary. Pedestal cabinets has option of wheels which makes it mobile and can easily be taken from one desk to another. Drawers are suitable for legal or letter size filing. Sliders providing easy smooth pull out with 90% extension. Central locking system with 2 keys. Cushions option available for 2 drawer cabinets suitable for sitting.